Some of the most common questions our customers have about our services are listed on this page, however, we would love the opportunity to speak with you in person about any specific questions you might have as well. Contact us to speak with someone from our team today! How did Upper Crust Food Service begin? Upper Crust Food Service began working with our first fraternity and sorority clients in the fall of 2009. The idea that food in the Greek community could be improved was what motivated our President Adam Guy to start our company. The news of a fresh new approach to fraternity and sorority dining quickly spread among those in the Greek community and the growth of UCFS was underway. Since 2009, positive word of mouth has propelled Upper Crust Food Service into a nationwide food service provider for fraternity and sorority houses. Despite our growth, we haven’t lost sight of personal service, customized menus and of course, great, fresh food. Where do you find your chefs and staff? We are proud to employ some of the best chefs in the country. Many of our chefs join our team looking for a better quality of life after working long hours, late nights, and weekends for high end restaurants, country clubs, hotels, and casinos. The work/life balance offered at Upper Crust Food Service is unmatched in the food service industry and we are blessed to employ such a great team. We understand that our company is only as good as our chefs on the front-line cooking each and every meal and interacting with our customers, so we work hard to find the right fit for your chapter and build that person up with positive reinforcement. Do you have local management or only the chef in our kitchen? This is one of the things that sets our company apart. Many of our competitor’s place ads for chefs and then place those chefs in your kitchen. They are essentially working remotely on an island and the success of your kitchen operation lies solely on the ability of that individual chef to be self-motivated. We invest in our campuses by hiring a local, full time Executive Chef who manages our staff and accounts. This allows us to take a hands-on approach to training and monitoring your account each and every day. Our Corporate Chef pulls the best menu items from around the country and provides those resources to each of our individual chefs to customize a menu for your chapter house. This process gives your chef a limitless amount of meal options and the ability to add in items that they know you will love. Only your chapters very favorite meals will be repeated during a given semester because we believe variety is a key ingredient to our success. What if we want to change the menu? We allow each of our chapters to adjust any menu we plan. It is your meal plan and our only goal is to ensure that you are satisfied. Typically, our chef or campus manager will meet with your kitchen committee or executive board to review upcoming menus. Any requested changes will be made quickly. We can also change your meal times or menu items to accommodate a special event such as a philanthropy or social engagement. We purchase our fresh ingredients from a variety of sources from broad line distributors to local produce companies. Each of our markets present different opportunities for fresh product and we take advantage of these opportunities. The great part about hiring Upper Crust Food Service as your food service provider is that we work directly with the vendors, order the groceries, and pay all the bills! Do you use fresh or processed food? One of the things that sets us apart is our chefs passion for fresh food. We encourage all our chefs to use fresh raw ingredients for each meal. It is very rare that we would open a box or a can in your kitchen. For example, our chefs will make a sauce for your chicken on the stove top with fresh ingredients as opposed to opening a can of sauce that is pre-made. This is a win-win for Upper Crust Food Service and our customers as it costs us less to make things from scratch and our customers receive a better-quality product. What types of meal plans do you offer? Our goal is to customize a food plan to meet your needs and your budget. With that in mind we offer a variety of meal plan options and we are always willing to customize those plans after speaking with your chapter. We offer full meal plans with breakfast, lunch, and dinner as well as limited meal plans for out of house members who might only need to attend lunch or a chapter night dinner. We also offer services such as 24/7 snacks, beverage programs, and more. Bottom line is if your chapter needs it and it is related to food we will find a way to provide it. Many of our customers are surprised that our cooking needs are actually pretty basic. Since we cook from scratch we need basic appliances such as a stove top, ovens, mixer, refrigerator, and freezer. We would be happy to provide an evaluation of your current kitchen and let you know if we would need anything done prior to beginning service for your chapter. We are building a new kitchen. Can you help us design it? We love assisting chapters who are renovating or building new kitchen spaces because we can offer up best practices we have seen in kitchens across the country that we serve. From designing the flow of your buffet area to making sure the chefs have the ability to interact with your members we can provide suggestions that will benefit your chapter for years to come. When it comes to purchasing equipment we can assist in finding quality used or new equipment and make sure that you do not spend more than need to on unnecessary items. What happens if our chef cannot make it to work? You can forget the days of ordering pizza and sandwiches when your cook is sick. Since we have a local, full time Executive Chef Manager employed on each of our campuses you will never be without a chef in your kitchen. It is our responsibility to ensure that your members are fed for each and every meal. Can you cater our special events? We love catering special events for our customers. Our chefs love to do something special and have the opportunity to “show off” just a little. We can assist you with everything from a Mom’s Day Brunch to a tailgate BBQ and everything in between. Since we are already cooking in your kitchen, using our services for catering will not only be convenient but will also save your chapter money. What happens if the chef isn’t a good fit for our chapter? We work very hard to find the right fit for each of our chapter houses. In the unlikely case that a chef is not perfect for your house we will remove that chef and replace them with another chef immediately. Since our local, full time Executive Chef Manager is on site this process can happen immediately as opposed to waiting for a change. Can Upper Crust Food Service start service mid-semester or mid-year? We have many chapters who run into kitchen issues in the middle of a semester and we are happy to set in and start our service at any time. Once we have an understanding of your needs and an agreement in place we are ready to bring your food service to the next level. Do you offer benefits to your employees? Although working with our customers is often the biggest benefit our employees mention we do offer benefits to our full-time employees. In addition to traditional health benefits our employees enjoy a wonderful work/life balance as well as paid vacation periods throughout the year. Would you be willing to hire our current chef? We are always willing to interview your current chef and in many cases this has worked out very well if you have a chef who is talented but simply needs additional resources in order to thrive. We can provide a support system as well as other cooks and utility staff to successfully run your kitchen. Do you offer sample meals to try your service? We would love the opportunity to show you what Upper Crust Food Service can do. One thing that is very important to us when we do a sample meal for a potential customer is to show them exactly what we would do for them on a “regular day”. We do not believe in putting on a dog and pony show and showcasing something that we will not be able to duplicate every day in your house. Our sample meals are meant to allow you to see the quality of food we produce and more importantly to get to know the chefs and management team that you will be working with. Request a sample meal and see how we can help! Do you service the state my campus is in? We provide service nationwide to fraternity and sorority houses, so chances are we are already working in your state and possibly even on your campus. If not, we can get things up and running for you in short order. No campus is outside of our reach. Do you offer late plates if I miss a meal? Absolutely! We know that the schedule of your members can vary from day to day and we want to ensure that everyone has the opportunity to eat the meals they have paid for. We offer late plates at lunch and dinner daily. Do you offer a snack service between meal periods? We are happy to customize a snack plan for your chapter. Many of our accounts have a kitchenette area where members have access to snacks 24/7. We can work within your budget as well as work with your members to stock this area with your favorite snacks and beverages. How expensive is Upper Crust Food Service? Believe it or not, our service tends to cost the same as running your kitchen independently. When comparing our service to our competitors we believe we offer the best value due to the quality of our service and our ability to customize a meal plan to meet your budget. Do you have references I can speak to? We are proud to provide you with a list of references longer than you would ever need to contact to ensure that we are a reputable company that actually does what we say we will do. We can provide you with Executive Council members, House Directors, and Alumni Board Members. Our customers quickly turn into fans and we so appreciative of their willingness to help us continue to expand our brand and our mission to elevate the quality of food served in fraternity and sorority houses. Can you handle students with dietary restrictions? We take pride in ensuring that every member of your chapter feels comfortable at every meal. This often means offering options to those with dietary restrictions which our chefs are trained to do. We will meet directly with your members with special requests and make sure that we are prepared to serve them each and every meal. Do you clean our kitchen and do our dishes? 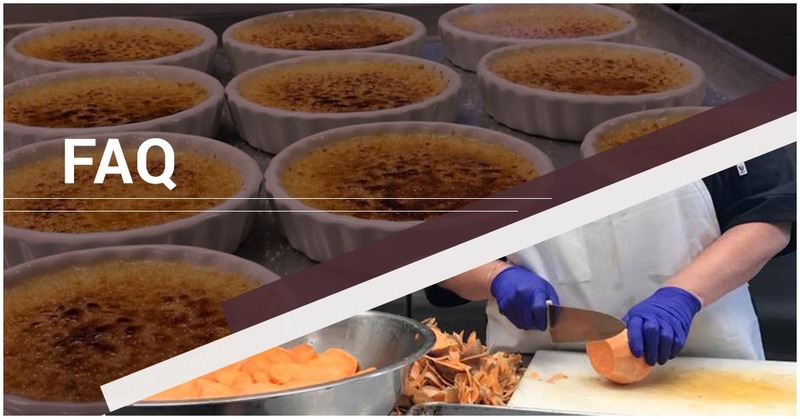 Upper Crust Food Service offers a full-service approach to each of our clients and we provide not only the chef but also all help that the chef needs to successfully operate your kitchen. This includes cooks, dishwashers, and even houseboys for our sorority customers. Many of our competitors require you to hire these people adding liability and work that we feel should be our responsibility. How does Upper Crust Food Service bill for your services? We bill our services directly to the chapter or corporation board. We offer simple and straightforward billing with no surprises. We even offer the ability to pay in a variety of ways to ensure your chapter’s cash flow and your treasurer’s peace of mind. Our office staff will work directly with you to set up a billing option that best fits your needs.